Jeremiah known as the weeping prophet and with words like this from the LORD no wonder because this kind of prophetic word will get you blasted every time and brings much suffering and resentment. People do not want to hear their real condition or face the truth about flaws in their armor. Let me rephrase that and say that I do not mean it as a blanket statement and an indictment on all people but it is often true even in the church among those who profess Christ as their Savior. SELF-DECEPTION is a tactic the devil has used from the beginning of his declension into evil. He deceived one-third of the angelic hosts, he deceived Adam & Eve, and he has been deceiving people ever since. He conditioned Adam & Eve to believe that they were deserving of something God was keeping from them and spurred them into making the decision to vote SELF as the center of their universe and fire God. The apostle Paul told us in 2 Corinthians 11 that the devil disguised himself as an angel of light. He also instructed us in Ephesians 6 to put on the full armor of God so that we could stand against the schemes of the devil. It is when we begin to do ‘comparisons’ we easily fall into the trap of ‘self-deception’ and wrongly evaluate our condition and position and follow a deceptive heart. Self-deception indicates that we do not even realize that we are deceived and therefore cannot know our own hearts. However, God does! He searches our hearts, minds, and evaluates our lives and truly there will be an accounting one day. We should all pray with David in Psalm 139:23-24 – “Search me, O God, and know my heart; Try me and know my anxious thoughts; 24 and see if there be any hurtful way in me, and lead me in the everlasting way.” NASU David knew that he could not escape the presence of God and even if he made his bed in hell God was there or if he ascended to heaven God was there. God knows when we get up, when we lay down and everything between. HE KNOWS! HE SEES! So acknowledging that I am a flawed vessel I cry out to the Lord for Him to ‘search me’ and ‘know me’ and if there is anything wicked or hurtful in me PURGE IT PLEASE and lead me in the way everlasting. I want to be a vessel for honor not dishonor. I want to be pleasing in His sight and when I reach the end of the journey to hear, “Well done, good and faithful servant, enter into the joys of your Lord.” It will not be because of what I have done but what He has done and I ask Him to guard my heart at all times. May the Lord be with you as you go through your day! Let’s move on to the next part of this consideration if we may. 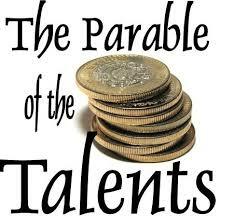 THE DOUBLE TALENTS – – Rewards for Faithful Service. Therefore, the more you give of what you have given to you the more He causes to be returned to you. God has called each of us into a unique ministry, service, or purpose in the Kingdom. You have a destiny. My destiny drives me. I know that in order to fulfill that purpose I MUST have the DOUBLE PORTION. I want to ‘blaze trails’ so that others can also walk in victory and eat the fruit of the land. I hope you catch this DOUBLE PORTION PROPHETIC ANOINTING. It is astounding! In 1 Kings 19 Elijah had just had his encounter with Jezebel and her prophets. He turned and ran to the desert and is having a deluxe pity party when he suggests that the best thing would be for God to kill him. It is there that God issues the marching orders and shows him the awesomeness of his office, anointing, and mantle. He then operates as THE LORD’S ANOINTED going forward. In verses 15-21 we find that he anoints two kings over two kingdoms and brings forth Elisha to take his place. That is not too shabby. Consider the history of Elisha. He was a successful farmer, overseeing twelve yoke of oxen and is handling the twelfth pair himself. That is not a small operation. He was an overseer, a doer. His name means – God is Salvation. Twelve symbolizes – Divine Government and Apostolic Fullness. 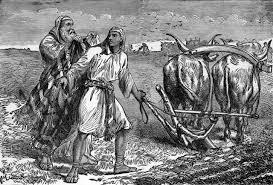 Oxen symbolizes – Treading out the Word of God. Twelve Oxen – The fullness of apostolic ministry. Elisha is a type of ministry to come! So, if you can receive it, the Early Church had the Elijah anointing and today the church of the Last Days is to operate in the Elisha anointing or DOUBLE PORTION. Follow the progression in the examples if you will. We are God’s firstborn (Hebrews 12:23). Joint-heirs with Jesus to the Double Portion inheritance! This is good for all times and seasons but the SIXTH DAY there was Double Manna. I believe prophetically we are in that time today. Consider the Double Rain of Joel 2 and we know that at the End of the Age there will be DOUBLE RAIN and DOUBLE HARVEST. So, I contend that God has given us the Promise of a Double Inheritance, Double Manna, Double Rain, and Double Anointing. We are the declared Church of Jesus Christ a glorious and triumphant church and God wants us to have whatever we need to become that in a manifest measure in today’s world. So I urge you to seek God to grant you a DOUBLE PORTION that you can use for the purposes of His Kingdom. May God be with you and enable you as you go through your day! BLESSINGS! Let’s press onward into this discussion and discovery. THE DOUBLE RAIN – – Spirit and Harvest. God Sovereignly gives this, but if there is going to be a DOUBLE HARVEST we will have to bring it in. 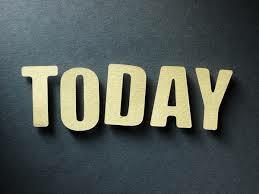 I truly believe that today is the beginning of the day of DOUBLE HARVEST in the Kingdom of God and that will require anointing, labor, finances, vision, and much much more! The most difficult time for the farmer is HARVEST TIME. He often would work from ‘daylight’ to ‘dark’ daily and sometimes seven days per week. He would work diligently to gather the harvest before it was spoiled in the field and lost. It involved all hands and the cook. Everyone was involved with no exemptions. I know that scenario growing up on a farm. Many are involved in establishing new churches or works for God’s Kingdom and that is hard work. It means sacrifice, not having all the structure that an established work has. It means ‘plowing hard ground’. BUT, consider the rewards! What a joy to see a local body developed knitted to the Body of Christ and the new souls born into the kingdom. We talk about the ‘harvest’ but are we plowing the fields, planting the seed, caring for the field? Double Harvest means Double Responsibility. THE DOUBLE ANOINTING – – Elijah and Elisha. This is an incredible story and one that has long fascinated me. 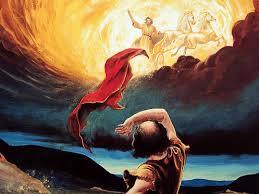 Imagine a DOUBLE PORTION of the Spirit and Anointing that was on Elijah! This is not only exciting but incredibly dangerous if the ‘metal of the man’ or ‘woman’ has not been tempered and tested as was Elisha. The key is having a SERVANT’S HEART. God anoints us to SERVE! Of course we do ‘warfare’, we pull down ‘strongholds’ we set the ‘captives free’ but the foundation is SERVANTHOOD! That is the heart of Jesus! Elisha had been a servant and now and now he has a servant in line to receive his mantle. But Gehazi was lacking integrity. He turned the focus inward and forgot the faithfulness of God. He merchandized the anointing and God will never tolerate that or bless that! I am convinced and have experienced the fact that God puts us to the test and allows us to be tempted so that we will not be destroyed by the DOUBLE PORTION. It is imperative that we ‘guard our hearts’ because this anointing is not because of us but because of God and His Kingdom! JOB’S DOUBLE PORTION – – A Right Attitude. This is a powerfully beautiful story of God’s promises and faithfulness. He does not forsake His children and if we suffer with Him we will reign with Him. 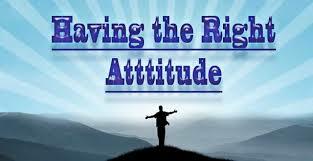 Again, one of the significant keys is A RIGHT ATTITUDE. We must develop a ‘spirit of forgiveness’ and refuse to fall into ‘hopelessness’, ‘despair’, and a mentality of ‘escapism.’ Remember when Job prayed for his friends is when God turned his captivity and began the restoration. Imagine that, in the midst of incredible adversity Job TRUSTED the faithfulness of God and developed a ‘spirit of patience’, ‘tenderness’, and ‘compassion’. The comfort we receive we are responsible to pass on to others. Job did not run from his problems he face reality. He stayed true under pressure and trusted God. He avoided charging God foolishly. His ATTITUDE enabled him to receive DOUBLE RESTORATION without bitterness or pride. Now he could minister rightly out of his DOUBLE PORTION! Let’s put things on pause here and next time we will move to the Double Talents of the New Testament. But until then may the LORD of Glory bless you richly guarding and guiding your steps. BLESSINGS! Let’s get to the getting to it, Okay? Deuteronomy 21:17 – – The Right of the Firstborn – DOUBLE INHERITANCE. Why? It is not favoritism but in order to insure that the firstborn would have extra means and ability to care for special family needs that might arise. In this we find the Law of the Kinsman Redeemer and this was often the firstborn. Hebrews 12:23 identifies us as the Church of the Firstborn. This son was given DOUBLE because he was DOUBLY RESPONSIBLE for the needs of the family. He was to use his DOUBLE PORTION compassionately for the good of the family and all the family members. You must keep that in mind. So the DOUBLE PORTION carried with it a DOUBLE RESPONSIBILITY. It was the ministry of headship. 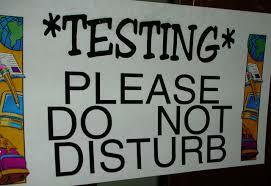 Do you know one of the hardest tests to pass in life? Prosperity and Abundance! Why would that be true for so many? Because in great prosperity there is tremendous temptation to become ‘self-reliant’ and think we are ‘self-sufficient’ needing no one and nothing but ourselves. I have found that God will trust you with anything as long as you can trust Him with everything! Paul advises in 1 Corinthians that we should always remember that we have nothing that we did not receive. It all has its roots in God! I’ve heard people pray, “Lord bless me double and I will bless others.” Really? What are you doing now with what you have? That’s right, in your present status! “Oh, but I owe this and that. I have this and that obligation, etc.” WHY? If I want the DOUBLE BLESSING I need to develop the attitude and heart that is conducive for having it. I believe if we get our hearts right God will do His part. Remember Luke 6:38 where the Bible declares that if we give IT (whatever we give) will be given to us. Most miss the IT in that passage. I must issue a warning of a ‘danger’ or ‘pitfall’ in this DOUBLE PORTION inheritance of the firstborn. This is illustrated in the Prodigal Son’s story in the attitude of the elder brother. You remember the story. The elder brother was heir and received a double portion or two-thirds of his father’s estate. The prodigal did not get another inheritance when he came back. He had squandered his and now he is at the mercy of the elder brother to exercise his DOUBLE PORTION responsibility. 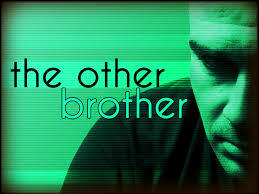 The elder brother failed in his attitude and had no compassion! I do not disagree that the prodigal was wrong, wrong, wrong but he came back repentant. What is our attitude toward those who fail? Those who created their mess made their bed and are now finding they must lie in it. Those who wasted their inheritance and opportunities? REMEMBER, if you have a DOUBLE PORTION as a firstborn your responsibility is to use it to minister to those who have lost theirs and sometime by their own doing. 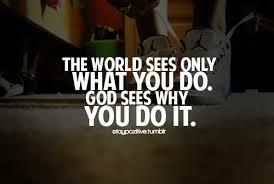 That is what Jesus does with us! He is never selfish or judgmental but extends compassion and seeks our restoration. I am convinced that if more caught the true spirit and reason for the DOUBLE PORTION more would be enjoying DOUBLE today. The time to develop a spirit of generosity and giving is when you have $5 not waiting until you have $50,000. Let’s pause here and pick up next time on the Double Manna and see where God takes us. May the Lord be with you as you go through your day and rain blessings upon you bountifully! CAN TODAY’S CHRISTIAN EXPECT A DOUBLE PORTION??? Previously we laid a foundation for The Law of Double Portion and now it is our objective to consider some of the inner workings of ‘Double Portion Blessings’ and how they relate to today’s believer in 2014. I personally believe that we are living in the time of THE DOUBLE: Double Rain, Bread, Anointing, and Restoration spiritually. It is my personal conviction that if we catch this in our spirits we will develop a hunger and thirst for the things of God in a new and deeper measure and elevate our anticipation spiritually. If I could guard against anything it would be to keep us from ‘stagnating’ in history (memories) of what used to be and from ‘fanaticizing’ in futuristic dreams and wishes about what God MIGHT DO someday. Instead I desire for us to take history and use it as a foundation and anchor to walk into what God IS DOING and bring those dreams and aspirations into current realities – POSSESSING THE PROMISES! That raises a very important point about this DOUBLE PORTION. It really does matter what you are getting DOUBLED. Today, I want to embark on the ‘responsibility’ of receiving the DOUBLE PORTION from God. Zechariah 9:12 – – We are called ‘Prisoners of Hope’. God has promised that He will render DOUBLE to us. That is a very powerful prospect and thought. We need to ‘desire’ God’s Blessings be poured out in our lives and I would say that most do, but is it a ‘consuming passion’? We need to ‘desire’ for God to use us in His Kingdom and I readily acknowledge that a person could have a wrong, selfish desire in all this but I do not believe that is you. If we do not ‘hunger’ and ‘thirst’ we will not be filled! There is assuredly nothing wrong with wanting to ‘know’ more about God and ‘know’ God more! There is nothing wrong with wanting to be ‘blessed’ more, ‘used’ more, ‘have’ more. It is okay to want God to bestow upon you so that you can give more in terms of ‘money, anointing, power, and revelation’. The focus is not you it is the Kingdom of God and His Righteousness. So, today, I want to begin dealing with the ATTITUDES not just ACTIONS. My motivation is we can be ADJUSTED in our walk so that God can use us in a dynamic manner in the days to come. I fully believe that you desire that! Next session we will take up the seven (7) examples given previously of the DOUBLE PORTION and focus on the ‘responsibilities’ and ‘privileges’ in them. Hopefully it will be informative and exciting. So until next time, may God go with you in all you do! BLESSINGS! 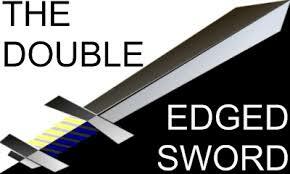 TWO SIDES TO THIS SWORD…. When religious people who are sectarian and hold deep prejudice in their hearts see what God is doing in reaching the lost outside their sect they become upset. I am reminded of what a man once said to me in which I served as pastor, “We want to reach quality people for our church.” QUALITY? I was somewhat taken aback and almost without thought responded, “What quality were you before you came to Jesus?” Jesus came to ‘seek and save’ that which was lost not a particular segment of society. Here the LORD clearly identifies that it is the LOST in need of His mercy and grace. I have contended for a long time that it is IMPOSSIBLE to get a lost man found until that man knows he is lost. In the natural if you do not know you are lost you will seek no help in finding your way and in the spiritual until you know you are LOST you will not reach out to the reaching hand of God for Salvation. I grew up in a rural church and watched things transpire in that church that caused me great confusion and helped me develop a mentality that prevented me from seeking God’s salvation. My attitude was, ‘if some of these people are going to heaven, God cannot send me to hell.’ That was a wrong premise but it was where I stood. I was justifying my life based on my comparison to others and that is not how God views us. When He looks at us He either sees the blood of Jesus or He does not. It is not how I stack up in comparison to Bob, Jim, Tom, Joe, or whoever it is am I covered with the Blood of Jesus. Sadly, some are ‘good people’ and because they are ‘good people’ and do as I did comparing themselves with others they see no need for God’s forgiveness, pardon, and mercy. They do no harm, give to the poor, and serve the community and somehow deep inside feel that their service and human goodness will purchase acceptance with God. It will not! The only access to the Father is through the Sacrifice of Jesus on the Cross. It is only as we are forgiven and the Blood of Jesus applied to our sins that we are accepted in the beloved. It is GRACE not our works. It is God’s gift not our efforts that brings us into the family of God! So as Jesus said it is the sick that need a doctor, the lost that need a savior it is also true that those who do not know they are sick or lost will ask for and receive no help. I was lost and did not truly know it for a long time. When I realized I was lost I also believed that I had gone too far and my case was hopeless. God’s incredible love penetrated that deception and through the love and persistence of some fabulous people of God He drew me out to the light and THANK GOD I AM SAVED! May God help us know our condition so we can receive that which He has for us! God bless you and be with you as you go through your day! If God was willing to allow Jesus to go to the Cross for us how could we not anticipate that He will provide for us everything we need to walk this walk? The condemnation we receive is not coming from Christ because He paid the price for us, is making intercession for us and will NEVER leave us nor forsake us. 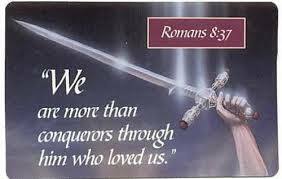 No matter what we face we are MORE THAN CONQUERORS through Him that loved and loves us. Paul goes on to tell us that NOTHING can separate us from God’s Love! NOTHING can ever cause Him to stop loving us. We may reject Him, turn our backs on Him, abandon Him but He will FOREVER Love us and reach out to us. He has provided everything we need through His Word and Spirit to not only be victorious but MORE THAN CONQUERORS in this life. I quoted this passage once and a person in the audience interrupted and said, “But brother that is for the next life not here on earth.” REALLY? You really want me to believe that victory and conquering is reserved for heaven. You really want me to dismiss the scores of passages from the Bible about victorious living and the fact that Jesus defeated the devil and made an open show of him making us MORE THAN CONQUERORS. You want me to ignore the promises of God regarding the help He provides for this Christian walk? NO THANKS! I’ll stick with the God of Victory and lay claim to His Promise that I not only can be but am MORE THAN A CONQUEROR through Jesus!